Co Londonderry members James Purcell, Dungiven YFC, and Geoff McNeill, Garvagh YFC, were celebrating at this year’s Balmoral Show after winning the YFCU machinery handling competition. The competition, held in association with long term sponsor Johnston Gilpin and Co, saw a large crowd of spectators at the Cattle Lawn, where they cheered on the teams. Johnston Gilpin and Co have supported the YFCU machinery handling competition for many years and provide the machinery for the young farmers to use during the event. Working closely with the Health and Safety Executive Northern Ireland (HSENI), Johnston Gilpin and Co assist with the planning of the designated course to test the competitors’ tractor skills and safety knowledge. Two members from clubs in each of the six counties, selected from county heats, made up the teams and the team who completed the course with the most points won the competition. 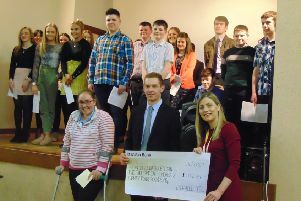 Second place was awarded to Co Tyrone which included members Adam Wilson, Cappagh YFC and Henry Giles, Seskinore YFC. Points were awarded for successfully making it through the course and driving through the posts, however teams were penalised for a variety of reasons including if they did not comply with safety regulations, touching markers and unnecessary damage to the ground. This competition was designed to test both the drivers’ tractor skills and safety knowledge. YFCU would like to thank Johnston Gilpin and Co for their continued sponsorship and support of this event. The association also extend their gratitude to Sean Keogh and Paul Kelly from HSENI. YFCU would also like to thank Chris Hamilton, Ballywalter YFC, Nathan McFarlane, Ballymiscaw YFC and Andrew Garrett, Ballywalter YFC who helped design the course.